l-Ascorbic acid (AsA) is an essential nutrient in the human diet. It is required for growth and repair of tissues, and severe deficiency can lead to debilitating diseases such as scurvy. Although relatively cheap to synthetically produce, ascorbate deficiencies are common throughout developed and developing countries. 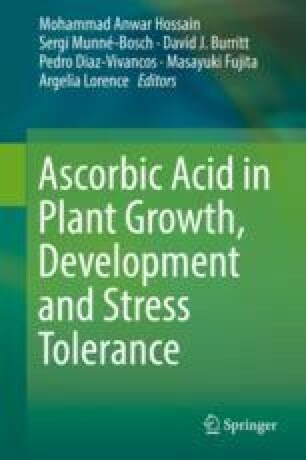 In plants, AsA is a key component of multiple antioxidant systems, which defend plant cells from biotic and abiotic stresses, and is therefore an attractive target for biofortification in crops. AsA metabolism is complex due to the existence of multiple biosynthetic pathways, which can contribute differing amounts of AsA depending on the plant species, organ, tissue type, and stress conditions. In addition, several pathways of oxidation and recycling of AsA exist, which together allow subcellular compartments to tailor AsA accumulation and turnover. Biotechnological approaches in model and crop species have been successful in increasing AsA concentrations, but these gains have not reached the potential some species of plants have to produce AsA and that could benefit industrial and public stakeholders. Given recent improvements in our understanding of AsA biosynthesis as well as the advancement in novel breeding technology, there is renewed potential to overcome limitations in AsA biofortification. Here we attempt to connect the current biological knowledgebase with novel technologies and crop resources to provide a strategy to improve plant-synthesized AsA in the world food system. Gavin M. George and Michael E. Ruckle contributed equally to this work. We would like to thank Prof. Samuel C. Zeeman and Prof. Bruno Studer for their continuing support during and beyond the preparation of this chapter. MR would also like to thank the World Food Systems Center for the contribution to funding this authors work.